Restore and refinish your floors, cabinets, furniture, countertops, leather, vinyl, stainless, chrome, cooktops, tile, grout and display screens with Rejuvenate and make them all new again. Along with their top selling Rejuvenate home restoration products, For Life Products also makes Pursfection purse organizers, Air Innovations air purifiers, Rejuvenate Auto care products and much more. Floor care products - Easily achieve flawless floors with Rejuvenate floor care products from For Life Products. Restore, Protect, Refresh and Refinish any type of floor with a complete line of products that takes the hassle and high cost out of home improvement projects. Find everything you need to bring new life to tired, worn out floors or help maintain and prolong the beauty of new floors. Choose from a selection of amazing floor care solutions for hardwood and all floors that includes cleaners, sealers, floor restorers, refinishers, applicators and kits that will leave your floors looking showroom ready. Home care products - Rejuvenate now includes effective, simple to use restoration solutions for the entire home. Their top selling Rejuvenate FLOOR Restorer has a whole family of home restoration products that deliver the same spectacular results and ease of application that has become the hallmark of Rejuvenate brand renewers. Restore your Floors, Cabinets, Furniture, Countertops, Leather, Vinyl, Stainless, Chrome, Cooktops, Tile, Grout & Display Screens with Rejuvenate and make them all new again. Rejuvenate makes it easy to get the professional results you demand without those costly contactor's bills. Do it yourself and save with Rejuvenate! Auto care products - Your car is your home away from home. Keep your vehicle's interior and exterior looking like new with Rejuvenate auto care products. Enjoy the same results and polish that Rejuvenate floor care products extend to your floors with easy-to-use car detailing products that give your car's interior and exterior professional quality results, minus the expensive detailing costs. From conditioners, vinyl cleaners and window cleaners to stain removers and protectants, you'll also find auto floor mats, mini vacuums and more car-friendly cleaning solutions. Clean air products - Keep your family breathing easy with the innovative ionic air cleaners that help remove dust, pollen, and harmful allergens from the air. Clear and condition the air in your home with Air Innovations brand humidifiers and air cleaners. Keep your wood floors and your family at their optimum health with technologically advanced and stylish Air Innovations humidifiers. Perfect for any corner of the home or office, choose from a variety of air cleaners, humidifiers, air ionizers and fans that will leave every room with cleaner and fresher air that will always be a joy to breathe. Purse organizers - If you've ever found yourself digging through your bag, desperately searching for your keys, wallet or cell phone in the bottomless pit you call a purse, Pursfection is a must-have accessory. Pursfection Interchangeable Purse Organizers will keep your purse, and your life completely organized with 9 handy compartments to house wallets, keys, phones, make up cases, mp3 players, and all of the other things we find ourselves toting around. Enjoy effortless access to your purse's contents and switch purses from day to day with ease and style. 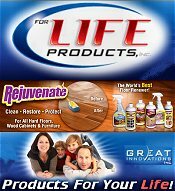 For Life Products delivers personal products that improve the quality of your life and fit your lifestyle, featuring floor care products, air cleaners, purse organizers, car, cabinet and furniture care products that are designed to save you money and time as well as make life easier and better.